What Creates The Best Christian Preschool Education? When it comes to an early education, not all preschools are the same. While all have common programs that will help a child grow physically, cognitively, and educationally, some are excluding key features that will help your child develop to their fullest potential at an early age. A preschool’s approach to education and discipline may be consistent across many schools, but many are missing a valuable element that will contribute to a lifelong of learning, meaning, and purpose. The missing piece is a spiritual foundation for a child to grow and continue their formative education well adjusted, with Christian values and beliefs that will carry them forward into their elementary education. The cognitive, social, and spiritual foundations of a great Christian preschool education will ensure that a child can realize their maximum potential. Preschoolers love to learn. Even though they may ignore commands from adults and become frustrated if they don’t have their way, they are incredibly eager to learn from their teachers. The value that a strong Christian preschool education places on a start to social development is indispensable. The social development and self concept of a child at these early ages is essential to their growth and development academically. While preschoolers do need rules and regulations, a loving and caring atmosphere must be provided for them to develop an appreciation for learning, with a spiritual dimension of love and concern for others. Preschoolers need a Christian preschool education that promotes: sharing, interaction with others, responsibility, expression of feelings, making good choices, compromise, and starting/finishing projects. While preschoolers are beginning their social development, they are also better able to develop emotionally as well. A good Christian preschool will give a child the chance to develop holistically with activities such as: stories, learning the alphabet, numbers and counting, arts and crafts, music, motor development activities, outdoor play, field trips and more. It is also important that the preschool provides a supervised environment that allows children to play freely and learn how to share and cooperate with others. An important and forgotten element to choosing the best Christian preschool education is asking the right questions as a parent. 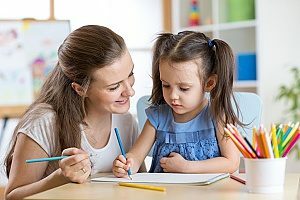 The first question to ask yourself is: “Is the preschool teaching values and perspectives that align with those I am teaching my child at home?” The answer to this question can ultimately determine the type of preschool you want. If you are raising your child in a loving, supporting environment of family values and a Christian upbringing, you are on the right track. A second question to follow up with is to the instructors. You should ask the teachers about themselves and their background. Learn their values and beliefs and discuss your values and beliefs. Make sure yours will be either supported or mold to the higher standard of theirs. 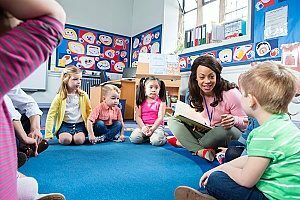 Preschoolers love learning, so these teaching styles will surely be passed on to their preschool students. It is important that after having a conversation with your child’s potential teachers. Then, partner with them. You can help not only your child but the other children in their preschool as well. A good Christian preschool will staff teachers and church members who emulate strong Christian values and an appreciation for children’s social and emotional development. The unique approach of a high-quality Christian preschool is its spiritual nourishment to a child. Alongside fostering social and emotional development, many preschools forget that setting the foundation for a spiritual life begins at an early age. Preschool children would benefit from a Christian preschool that incorporates the bible and its teachings into its curriculum. A child should not only learn about people, animals, nature, colors, shapes, and other simplicities without knowing that God created them. They should not learn about kindness and compassion, understanding, tolerance and love for their friend without knowing that God embodies all of these things. It is important for a preschool child to not only learn these things by playing with their peers and learning lessons from their teachers, but also attending a weekly, fun chapel service that is bible based. Here they will learn to appreciate a loving God in their lives and embrace the values and beliefs of their teacher at a young age. When children have this upbringing, they will gain a headstart in adjusting to elementary school than they would have in a less spiritually, socially, and emotionally centered preschool environment. If you are interested in enrolling your child in a Christian preschool or want to find out more information on its benefits and curriculum programs, reach out to Pastor Paul Collinson-Streng at Fairfax Christ Evangelical Lutheran Church. He will offer guidance and perspective on how a Christian preschool can help your child develop to their fullest potential at an early age.